Smart meter articles have graced my computer screen and a sense of “phew, at least we don’t have to worry about those things” always came to mind after reading them. Then one morning, gazing out into our backyard, a smart meter attached to our house caught my eye, bringing immediate shock to my brain. How could this happen? I did not receive any notice in the monthly energy bill; no letter, nothing. The smart meter just appeared. The next day, Monica (my wife) and I researched ways to protect ourselves from being spied upon and forced to have unwanted radiation spewed into our home. In that effort to defend our safety, health, and privacy we sent SWEPCO/AEP (the power company) a demand notice giving them 30 days to remove the smart meter, and replace it with a safe analog meter. The same day SWEPCO/AEP received the notice they sent a young man to our home attempting to calm the crazy people. To them, obviously we were crazy and needed to be fed the company’s talking points of how safe, secure, efficient, blah blah blah, and how they do not retain or gather personal information. After I escorted the robot to the door, he let me know that they will not change the meter and if we do so then the power to our house will be cut off. 30 days expired and our default notice was immediately sent. To summarize the default notice, it made clear that we have never and do not ever intend to steal power, reminding them we had never being late paying our bill, among many other legalities, including informing them that a licensed electrician was going to replace our meter. We sent the electric monopoly their meter back. Several days later my wife called explaining that SWEPCO/AEP had cut the power to our house without any formal notification. When I arrived home, the normal site of our well-lit 1895 Victorian home off the small town square of Marshall, Texas, was dark. The darkness appeared to be a hole in the town inviting any thug, thief, vandal, or the like to come on in. There is nobody home here and certainly no operating alarm system. Today was the first full day of no electricity, which means no hot water, our food will ruin in the freezers, and now the lack of light invites malcontents. 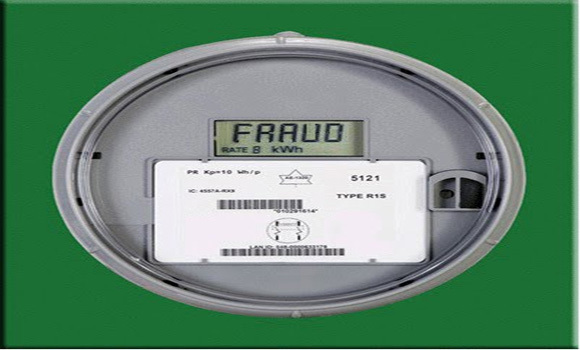 All this evil occurred because we simply wished to protect ourselves from unwarranted and unlawful meters. The local officials in government talked to the monopoly and their talking points worked well. The Mayor said, “Well Kevin, they said the meters aren’t smart meters and they’re safe.” So that’s the end of the help from the government here in happy roll over sleepy town Marshall, Texas, zombie land. After sending the government the manufacturer’s website, which details how these meters are of the smart variety, the local government said I should get legal council because they just can’t do anything. These officials can ticket me, fine me for all sorts of reasons, give monopolies permission to radiate and invade my privacy. However, they can’t, rather will not, re-enforce a citizens right to protect him/her self by opting out of having a dangerous spy attached to the citizen’s home. So for now, we wait on unreturned phoned calls from every politician including Ted Cruz. Although US Senator John Cornyn’s office actually answered the phone telling me bluntly, “Our office can’t get involved with anything like this. This matter is of a personal nature between a private person and another business. Unfortunately we can’t help.” I think my tone was less than polite when I responded with something not suited for repeating even in this article. Luckily we have wonderful family that has taken us in like wet puppies out of the cold. We will, however, fight and fight hard for our right, and our neighbor’s rights, to opt out of being forced to accept these meters invading us. Please wish us luck friends, into the breach we go again. And good luck all of you! Mine is marked and posted “No smart meter” I will defend MY CHOICE with a weapon. It is NOT ALLOWED here.